3 months ago, Zoto launched their mobile recharge app which lets you purchase airtime for any network in Nigeria using your ATM card. Aside that, they also introduced the referral promo which gives N1,000 cash back on your first recharge of N100 and above. You also get N1,000 cash back for every person you refer. A lot of people actually enjoyed the offer while it lasted. For all those who missed out on the first referral promo, this is another opportunity as Zoto has re introduced their referral promo. The rules and the conditions still remain the same. => Download the Zoto app from this LINK. Note: Use TECHYR as your referral code. 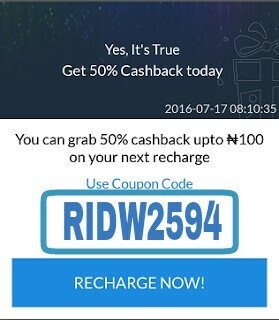 => Recharge yoir phone using the app and you will be instantly rewarded with N1,000 cash out in form of airtime. That's all. If you have any question, feel free to ask. So every body i invite must use their own ATM card? Enter your comment...is it safe putting my atm details on this app. Thank you for your post, however the maximum amount customers can get from our referral promo is N20,000. There's MORE with Zoto! On first recharge, New users get 100% cashback with the ZOTO100 coupon code while existing users also get multiple bonuses with coupon codes like ZOTO50 and ZCC550 when recharging.